basic one-face warp w., in which a knit is worked from one fully threaded warp. One thread forms stitches alternately in two neighbouring columns. 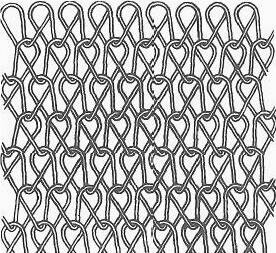 By the pulling of loops, stitches are made alternately on one side, then on the other. Used in the production of silk underwear.